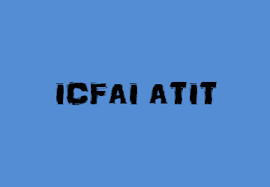 ATIT (Admission Test for ICFAI Science and Technology) is a national level entrance examination and also called ITSAT (ICFAI Tech School Admission Test).The exam is conducted by the ICFAI Foundation for Higher Education, Hyderabad. The examination is held for the candidates those are interested in various engineering courses. ICFAI has established 11 Universities across India. The ICFAI Universities are located at Hyderabad (IFHE, which is a Deemed University), Dehradun, Baddi (Himachal Pradesh) , Jaipur, Ranchi (Jharkhand), Meghalaya, Mizoram, Nagaland, Raipur, Sikkim and Tripura. According to ATIT, the world needs leaders who understand science and technology to keep up the pace of innovation. ICFAI Group is focused on creating the leaders of tomorrow in the field of science and technology. Students securing a minimum of 60% in class X and class XII with Physics, Chemistry, Mathematics and English as compulsory subjects. The students studying in class XII or its awaiting examination results can also apply. The applicants must have studied Physics, Chemistry, Mathematics (PCM) and English as their subjects in the qualifying examination and must have passed individually in each subject. The candidates will get admission on the basis of the scores secured in JEE Main, ATIT, State Level and Other National Level Engineering Tests. OMR Application Form: Applicants are required to fill up the OMR Application Form enclosed and send it to the Admissions Officer, ATIT at Hyderabad. Applicants can apply online by filling up the Application Form available at www.icfaiuniversity.in/atit and make payment of Rs.700 towards the cost using Credit/Debit Card (Visa / Master Card / Internet Banking) through secure internet payment gateway. Applicants applying online should upload their passport size colour photograph while filling the Online Application. The ATIT Prospectus will be sent to such applicants. The exam will be pen and paper based (offline) and computer based (online). The duration of the examination will be two hours. In both online and offline tests there will be multiple choice objective type questions from Mathematics, Physics, Chemistry and English. Each subject will consist of 30 questions. ATIT is an aptitude test conducted in the following modes. Computer Based Test (CBT) format. The test is scheduled from May 2018. The test is of 2 hours duration and is conducted in 2-3 sessions per day at test centres all over India. Paper Based Test (PBT) format. The test is conducted on May 2019 The test is of 2 hours duration conducted at select cities (Agartala, Aizawl, Baddi, Dehradun, Dimapur, Gangtok, Hyderabad, Imphal, Itanagar, Jaipur, Jamshedpur, Lucknow, Patna, Raipur, Ranchi, Shillong, Tura, Varanasi and Vijayawada). The answers have to be marked in the specially designed OMR answer sheet which will be provided at the time of the admission test. The admit card will be available in the month of April tentatively. The admit card will be available through the official website. The admit card is an identity of students, without admit card the candidates will not be allowed to appear in the examination hall. Required Identification before entering the exam hall: Candidate must present an original, photo identification such as Passport; Aadhar Card; Voter ID; College ID or a notarized Affidavit with photo, signature, date of birth and residential address. Photocopies of the original are not acceptable. Candidates applying for admission will be offered B. Tech. Program based on their scores in JEE (Main) / State Level/ Other National Level Engineering Entrance Tests. Candidates must also appear in ATIT and other tests in order to enhance the chances of getting admission and they should indicate their respective test Application Number in the OMR Application Form. Also have to submit the attested photocopy of the score card on or before May. Please note that the selection of the candidates will be withheld in case of non-receipt of the test score card before the due date. A student have to indicate maximum 5 preferences of Branch of Engineering in the Application Form.